The Fellowship was fortunate enough to obtain a copy of ETHER #1 from Dark Horse Comics. Matt Kindt writes, and David Rubin draws, colors, and letters. Boone has been traveling back and forth to the Ether for years now. He’s a scientist and explorer of the magical realm, centering his studies in the city of Agartha. This time, though, his friend Glum the gatekeeper tells him that his presence is required at the Lighthouse. The Mayor awaits him there, and recruits him to solve a crime (which I won’t spoil here). But Boone has to return to Earth, and his life there is very different. Said crime is pretty high profile, and Boone already has a list of suspects. But he’s a careful detective, and won’t be fooled into following evidence in the wrong direction. He also has a ton of mysterious backstory, some of which is hinted at in this issue. If there’s one thing Kindt can do, it’s weave a complex story. And Rubin’s art fits Kindt’s style surprisingly well, seeming equally comfortable with the fantastic and the mundane. I’m really looking forward now to learning more about Boone and how he’s connected to both of these worlds. And how the worlds themselves are connected. This is the first issue of what I think will prove to be an amazing story. 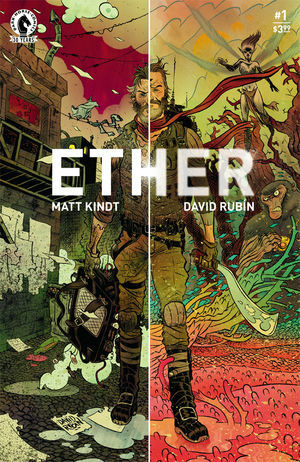 ETHER #1 is available now at your FLCS or at darkhorse.com.